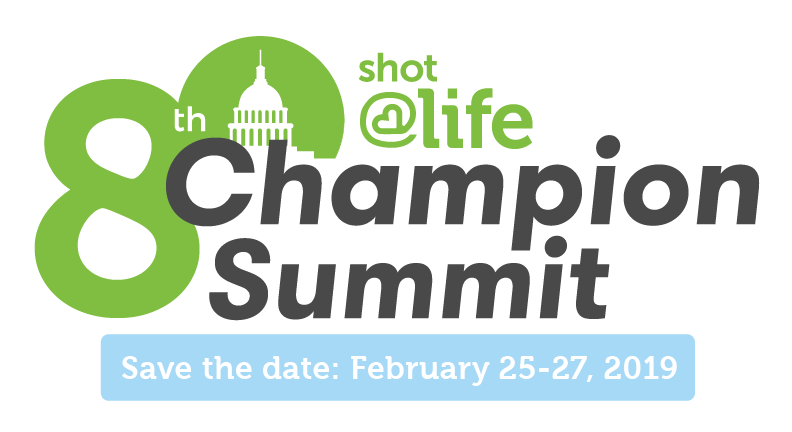 More than 120 grassroots advocates from across the country are meeting from Monday, February 25 through Wednesday, February 27 in Washington, D.C. for the 2019 Shot@Life Champion Summit. Join them! Deepen your knowledge about global childhood immunization programs and issues, sharpen your advocacy skills, and meet with members of Congress on Capitol Hill. The deadline to apply is December 31 at 11:59 p.m. ET. Applicants will be notified of their acceptance in early January. With amazing speakers and interactive workshops, you won’t want to miss your chance to claim one of the 10 spots GFWC offers to have your registration fee, housing, and most meals covered, with the opportunity to apply for travel expenses through GFWC. Apply now! Recognizing this concern, the March of Dimes created Mission: Healthy Baby®, a baby shower program specifically for military families that provides free pregnancy and newborn health information and free baby items through our Military Baby Showers. GFWC members can get involved by knitting blankets and hats for the babies as well as volunteer to help host a shower in your community. The invocation was delivered by Rear Admiral Margaret Kibben, who joined the Navy in 1986 and retired just this year. She was the first woman to serve as the Chief of Chaplains of the United States Navy. Next was Denise Rohan who joined the army in 1974, and in 2017 was the first woman elected National Commander of the American Legion. She spoke about the journey of the women on stage, “she-roes,” who had been first in their fields. Our thoughts are with the family of Pat Nix, California Past State President (1992-1994), who passed away on November 7. The service will be held on November 16 at 10 a.m. at the First Presbyterian Church in San Bernardino. GFWC Maine, the Covina Woman’s Club (California), the Woman’s Club of Madisonville (Kentucky), the Hoover Juniorettes (Alabama), and the GFWC South Baldwin Woman’s Club (Alabama) are featured on GFWC’s Blog for their Veterans Day projects. Have a success story to tell? Email pr@gfwc.org. Giving Tuesday is a global day to help others through your generosity. It takes place the Tuesday after Thanksgiving, reminding us to give back. Giving Tuesday is an opportunity to support causes and organizations that are important to you. 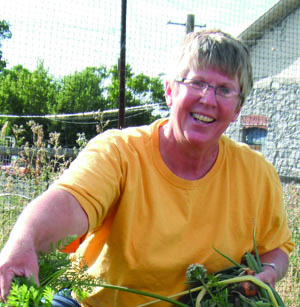 Visit the GFWC Marketplace to support GFWC this Giving Tuesday and make a world of difference. 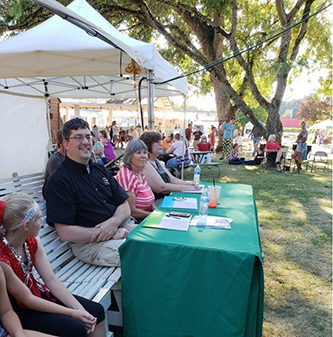 GFWC is pleased to announce that Stephanie Potell has joined our staff as Executive Coordinator. She will be providing support to the Executive Office, with a focus on Human Resources & project management. Please join us in welcoming Stephanie to our team! Spread the word that the call for 2019 Croly Award is now open! Encourage all journalists who have advanced the rights of women to apply by April 30, 2019 using this application form, and consider sharing on your or your club’s Facebook page. A deserving journalist in your community could win! You’re invited to GFWC Headquarters on December 5 for our annual Holiday Open House from 3:00-6:00 p.m. Join us in celebrating the season at 1734 N Street NW, Washington, DC 20036. RSVP by emailing events@GFWC.org. 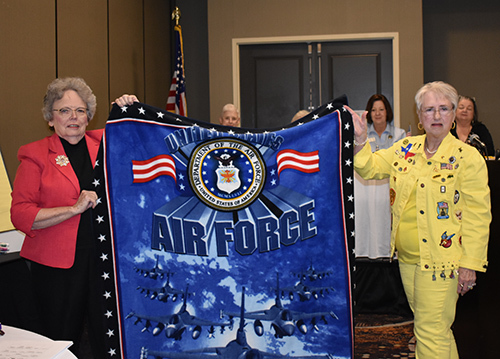 Donna Hogue (right) and GFWC Texas President Carol Habgood display one of the Air Force fleece throws Donna will provide to women in the Air Force. GFWC Texas embraced the Women in the Military Initiative after learning about the Seven Grand Initiatives of GFWC International President Mary Ellen Brock’s Administration. With 24 base locations and hundreds of recruiting stations and ROTC programs on Texas soil, all branches of the military are represented. 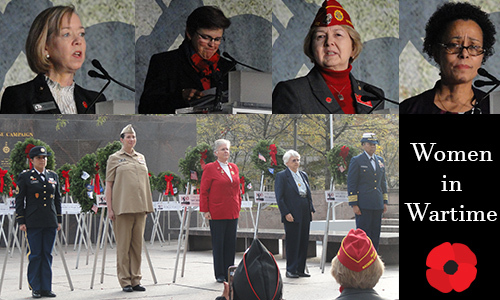 GFWC Texas is proud of its rich heritage of supporting U.S. service women and men. Past Caprock District President Donna Hogue has offered her talents in making fleece throws for the project to provide up to 120 lap quilts throughout the 2018–2020 Administration. These quilts will be presented to active and retired service women in recognition of their service to our country. She brought 53 throws to the GFWC Texas Fall Board Meeting to be distributed to the Districts for presentation to military women. Donna has made hundreds of these quilts since she began this project eleven years ago. Donna is a Gold Star Wife and makes the fleece throws in memory of her husband, 1st Lt. Robert E. Malone, who sacrificed his life in Vietnam on April 15, 1968. GFWC Texas is proud and grateful to Donna for her leadership in this initiative, along with the many other projects across the state geared toward assisting women in the military. GFWC Texas salutes and honors their service. Introduced in both the House and Senate, “Miranda’s Law” aims to keep unsafe school bus drivers off the road. This legislation would require real-time alerts for every school district across the country and trigger driver infractions to a database monitored by the federal Department of Transportation. Under current federal regulations, employers of school bus drivers are required to check their employees’ driving history records annually. If a driver fails to self-report a DUI, reckless driving, or a license suspension, it could be up to 364 days before a school district or motor carrier obtains that information. Join GFWC in supporting Miranda’s Law and ensuring that those behind the wheel of school buses are safe drivers. The GFWC Warren Junior Women’s League (Ohio) collected over 130 prom dresses, along with shoes, jewelry, purses, and perfume, for girls who couldn’t afford them. “Every Girl Deserves a Little Bling” nights were held at four school districts for young women to choose from the donated items. Since prom is in the spring, collecting in January is perfect timing. The project was listed in the GFWC Top 10 Projects. Don’t miss our great holiday deals in the GFWC Marketplace! Get free shipping when you place an order on Black Friday, November 23, and 25% off on Cyber Monday, November 26. Need a perfect holiday gift to go with our holiday sales? Get our new 2019 “Year in Pictures” Calendar for $10 in the GFWC Marketplace! The 12 winning photographs are beautifully displayed in desk calendar format for the first time. 5. After the officers and chairmen have given reports, the next business in order is unfinished business. A president shouldn’t ask if there is any unfinished business. As she puts together the agenda for the meeting, the president should know what the unfinished business from the previous meeting was and can confer with the secretary to make sure it is all listed. When the “Unfinished Business” part of the meeting begins, the chair can simply say, “The first item of unfinished business is…” and continue in that form. The term “old business” is not used. Items in this section of the club meeting are any business that was under discussion at the previous meeting, but could not be finalized because either time ran out or further research needed to be conducted, and any business that was scheduled to be done at the previous meeting, but was not discussed before the meeting was adjourned. 8. If your club has a program scheduled, it may be scheduled for the end of the business meeting, or during the meeting, whatever the club decides and/or whatever is best for the presenter of the program. Even if the program is at the end of the business meeting, it is a good idea not to adjourn the meeting before the program is presented. That way, if there is an idea or cause sparked by the program, members can move to take further action because the meeting is still in session. 9. Announcements. The Chairman may make announcements at this time and may call on others to make announcements, and members may stand to be recognized to make announcements, as long as they are germane to the work of the club.